It's Monday and time for a new Squigglefly challenge! Today, Rhonda's Rowdy Rascals bring you Challenge 4914 - to use embossing or a die cut. I used 2 different die cuts on mine - Spellbinder's A&B Die Cuts. Be sure and check out the projects of the Design Team for some inspiration and, if you have time, leave them some love on their blogs! Remember, there is always a prize to the weekly challenge winner. Thanks for stopping by - later gator and hope to see you at the challenge! TOOOO CUTE! Love the little presents on the side. My kids would probably say this is what I look like! LOL! Love your card. cute card! Looks like Granny Gertie has all her shopping and wrapping done! Wish that was me! Kathy, love your Granny Gertie card!! 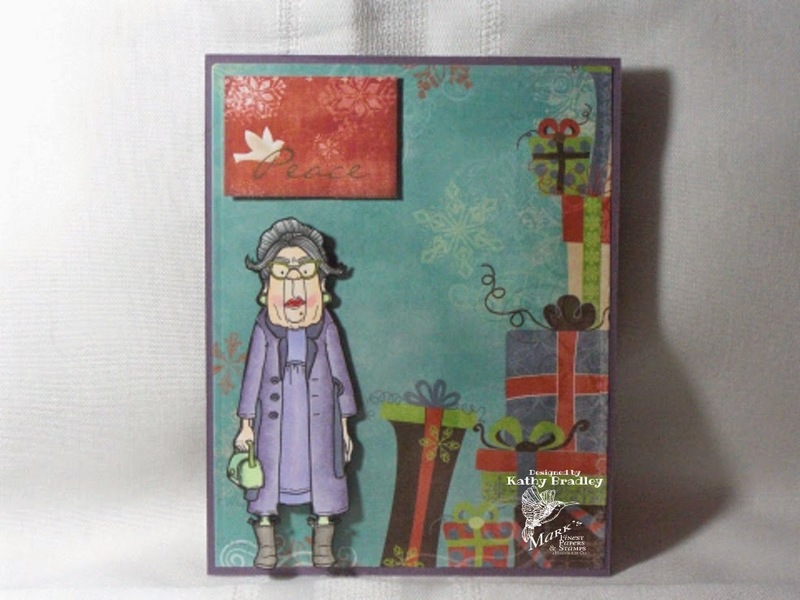 Kathy, this may be my favorite card you have made this year!!! Oh my gosh, it made me laugh and smile (still smiling). Fun, fun, fun and I love the paper you used. Hugz - millions of them.